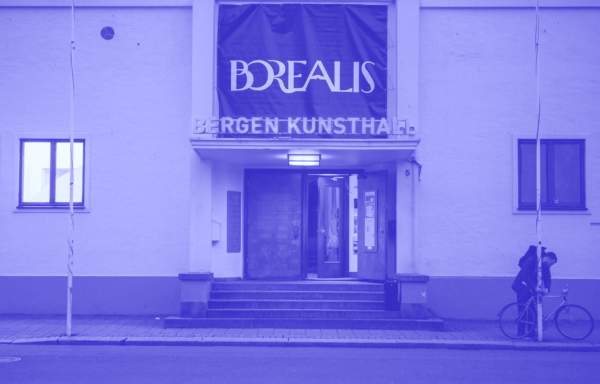 Join us for an evening where Borealis takes over the Bergen Kunsthall, filling its spaces with experimental music, noise, movement and pictures, taking you from quiet listening to wild dancing. Over the course of four hours, Welsh improviser Rhodri Davies will transform your understanding of the angelic harp; in her new film British artist Marianna Simnett will tell a story of a little girl who wanted her voice to be lower; Danish artist Adam Christensen will bare his soul in a howling accordion performance; Canadian composer Sarah Albu explores our relationship to technology in her FutureMoves aerobics workout; Chinese artist Yan Jun combines noise, objects and gesture in his micro-performances; Angharad Davies & Sebastian Lexer deconstruct a violin in their piece for violin, bass cabinets and live electronics; and N.M.O. 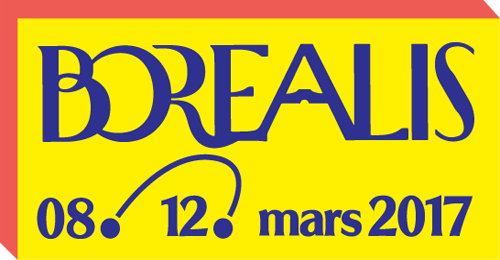 will energetically ride the line between Fluxus intervention and live techno. As well as a packed night of performance all over the house, Matana Roberts’ exhibition I Call America will be open to view, there will be a record-fair with releases from Borealis festival artists and the bars will be open serving our special Borealis beer. Sarah Albu is a Canadian experimental vocalist, composer, sound artist and performance-maker currently based in the Netherlands. Her background in theatre and obsession with science fiction, dating from childhood, breed darkly comedic imagined worlds. Equally active as a free improviser, new music soloist, and chorister, she is comfortable lending her voice to settings ranging from early Franco-Flemish polyphony to noise and psychedelic rock. An avid knitter, environmentalist and folk dancer, her recent work explores the effects of rapidly developing technology on our bodies and lives through a mix of curiosity and nostalgia. “I met Matthew Dickman at the Violet Crab Cabaret. An American writer on a visit in London. He spoke about a twin brother. Once playing oracles in a science fiction film. Floating in water with Samantha Morton. Predicting the crimes of the future. From New York he sent me three poems. I added a melodrama vocal. Percussion heels. The accordion. Rhodri Davies (b. 1971) plays harp, electric harp, and live-electronics and builds wind, water, ice, dry ice and fire harp installations. He is obsessed with Neolithic Rock Art, Concrete and Sound Poetry and the music of Sun Ra. His regular groups include: HEN OGLEDD (with Richard Dawson and Dawn Bothwell), Cranc, a duo with John Butcher, The Sealed Knot, Common Objects and a trio with John Tilbury and Michael Duch. In 2008 he collaborated with the visual artist Gustav Metzger on ‘Self-cancellation’, a large-scale audio-visual collaboration in London and Glasgow. In 2012 he was the recipient of the Foundation for Contemporary Arts, Grants to Artists Award. field recording and many different means of performance, such as a sleeping concert where he explored noise-hypnosis. He describes his music as ranging between super quiet, drilling, out of control, sleepy, conceptual, funny or noisy, but always simple. During his project Living Room Tour Jun visited private homes and played on objects found there to create temporary places to listen together as an active action. Angharad Davies lives in London even though many think she still lives in Wales. Since moving to London in 2002 her exploration of the violin took a different path from where she was heading after studying in Sheffield, Swansea, Manchester and a 6-year period of work, freelancing in orchestras in Düsseldorf. Slowly becoming immersed in the vibrant London improvised and contemporary music scenes opened up a fascinating new world of possibilities and opportunities. This has given her the chance to collaborate with countless inspirational people. She has a black cat. Sebastian Lexer’s musical life is focused on free improvisation and the experimental. The role of technology has become an increasingly integral part of his music, best reflected in his creation of and performances with Piano+, an electroacoustic extension to the piano. His interest in the exciting sound world ‘in between’ the acoustic instrument and its contingent electroacoustic modification is the basis for various artistic collaborations and performance system developments. Marianna Simnett is an artist based in London. Her work spans video, performance, installation and drawing, with a focus on threats to the health of human beings and our environment. She blends real and imagined events, often performing as a protagonist undergoing significant physical duress. Music is served as a soothing antidote to the visceral overload, to slow the senses, to lull us gently and steadily into disquiet. N.M.O. is the project between drummer and producer Morten J. Olsen and synthesizer aficionado Rubén Patiño. N.M.O. incorporates club music, performance, military drumming, fitness and absurdity. What they call ‘Military Danceable Space Music and/or Fluxus Techno’ is a unique blend of repetitive percussive patterns and synthetic sounds that combined with performative aspects explodes during their short and intense live shows. By stripping away the smoke and mirrors of electronic dance music – periodically running away from the laptop and presenting almost unfeasibly tight percussive patterns in situ – the duo demystify the romantic notion of aerobic.